I haven’t done a give away in a few months and that is quite unlike me! Therefore, it is time for another Disney Fashionista giveaway! This time we are focusing on the Beautifully Disney collection. I am a huge fan of the, now discontinued, collection and I want to share with you some that I have been blessed to get access to. See below for the contents of the give away and how to win! The give away consists of a makeup bag, 4 mini lipsticks, 8 mini nail polishes, an eyelash curler and a pack of makeup sponges. Of course, all of the makeup is from assorted Beautifully Disney Collections. To enter to win, you need to sign up for the newsletter on my home page of Disney Fashionista (it’s on the right side of the page). I have a master list and can see all. If you are already a subscriber, just comment below as to what you love about the give away and I will enter you. Bonus entries of sharing and commenting on FB will be entered only after you subscribe to the newsletter. I will announce the winner Sunday, August 2nd!. Good luck to all my fellow fashionistas!! I couldn’t decide on any of that collection so don’t have any. What a wonderful giveaway! I LOVED the Beautifully Disney collection, and was so upset to learn that it had been discontinued, so of course I absoluetly LOVE this giveaway! I didn’t know this was discontinued. I would have bought more! Thanks for doing this giveaway &’good luck everyone! Wow this is such an awesome giveaway! I absolutely love Alice!! I was upset when I finally discovered these items just to see them retired. Also, love this blog, you always find the cutest Disney things! I would love to win this giveaway. I don’t have any of the Beautifully Disney makeup so it would be great to get some. Thanks! Just signed up for the newsletter. Such an awesome giveaway! Thanks for the opportunity! I love Beautifully Disney and am sad to see it go! Would be the absolute perfect way to experience a first time visit in November as a truly Disney Fashionista!! Thank you !!! I love EVERYTHING about Disney and the makeup looks like it’s so much fun! Just signed up for the newsletter and so excited to start reading it! This is an amazing giveaway. I haven’t tried a lot from the Beautifully Disney line, but I was able to snag the Haunted Mansion eye shadow palette which I LOVE. The Alice in Wonderland stuff looks fantastic. 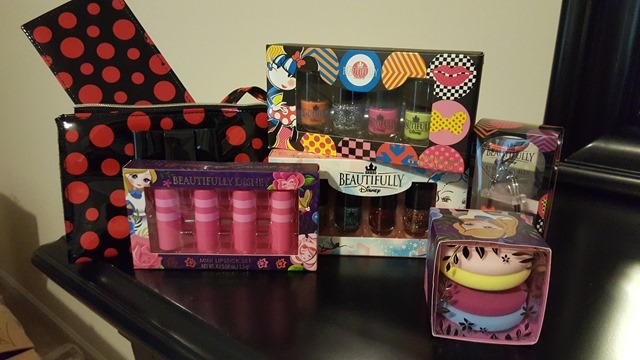 I love all of it….the Cheshire striped lipsticks are my favorite though. I am excited about this giveaway! If I won it I would give it to my daughters to share and enjoy! I have just signed up. I love all Beautifully Disney products. I have shared and commented. What is not to love?!!!!! I love this giveaway! I’ve wanted to try lipstick for awhile and Disney lipstick would be a great way to start! Susan Silva you are the lucky winner!!! Please PM me at [email protected] with your address and I will send it off to you!! Congratulations! Do you Wear Your Favorite Disney Park Close To Your Heart? ?